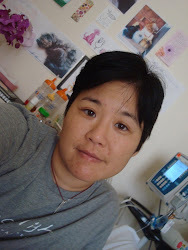 I have been in the hospital for 8 weeks and 2 days under experimental treatment. Each night they drip in Foscarnet that makes me feel like I'm being electrocuted and my brain in particular, deep fried. These sensations last for about five hours. I finished the 6 week course on Monday and since then have watched my mood plummet through the floor. I think I was in too much pain to have the luxury of depression. I know it's chemicals. Foscarnet in until the I am living death. Focarnet out, Valcyte in until the depression is unbearable. I make it to 6 weeks of Foscarnet and now the Acyclovir goes in. I wake up sobbing and don't know why. Acyclovir out...constipation and diarrhea. My friends come and they hurt me. I curl myself tightly into the smallest ball of flesh and close my eyes. I pray for my heart to stop beating and it is then I know that it's got me. I am being pursued by the desire to die and it has its oily, cold hands wrapped around my eyes and head. I can smell it. It scares me. It pushes people away. It confuses me. I don't remember who to trust. I don't remember who won't hurt me or if it is inevitable that I am a pulsing, toxic open wound and any contact will hurt. I am terrified. I am supposed to rest post-treatment in a stress free environment for like a year or something. I am afraid to stay here. I am afraid to go home. I pull further into myself at the thought of going to a psych ward. I know I'm being tricked to believe there is no place for me. I know it's a trick, but it's a tricky trick and I am fooled. A glimmer of relief is the voice of my mom saying "It's going to be ok. You are going to be ok."